Billionaire SAYS EU should regulate what you see on social media! The billionaire has made the claim because he believes that voters minds are being controlled and “manipulated” by social media. Mr. Soros has a close relationship European leaders, meeting them 11 times since nation voted to take back control. Prime Minister Theresa May has had just three meetings with European leaders in the same time period. 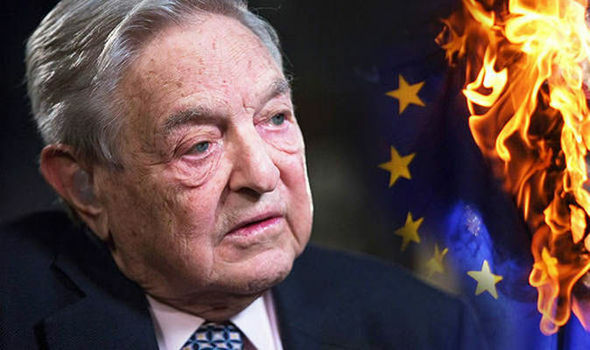 It was revealed a few weeks ago that Mr. Soros had quietly given half a million pounds into groups trying to block Brexit and overthrow the Tory government. He wrote that social media can “influence how people think and behave without them even being aware of it” and “this interferes with the functioning of democracy and the integrity of elections”. “President Donald Trump would like to establish his own mafia-style state,” he said, claiming the President was part of the same problem as North Korean Dictator Kim Jong-un. “In the US, regulators are not strong enough to stand up to the monopolies’ political influence. The EU is better positioned, because it doesn’t have any platform giants of its own,” he continued. What do you think? Should the European Union be the organisation that decides what you see and do on social media? DO YOU AGREE WE NEED A FULL AND CLEAN BREXIT? Read: "Financial pressure mounts on the EU"
Read: "Marauding gangs from Eastern Europe"